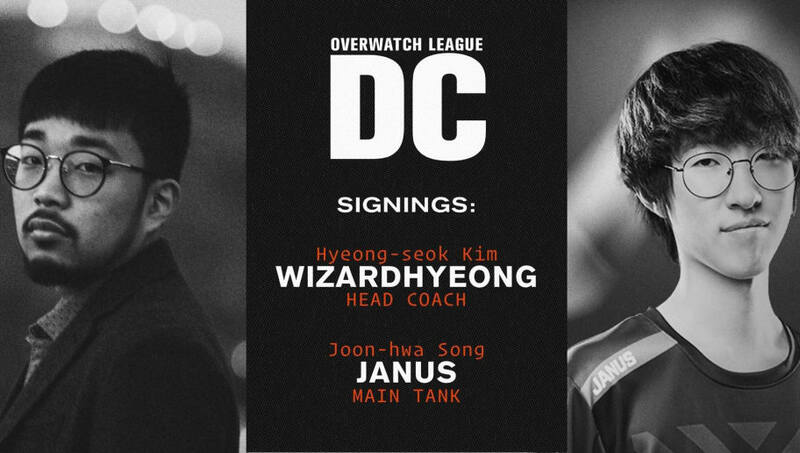 Hyeong-seok "WizardHyeong" Kim​ and Joon-hwa "Janus" Song have joined the Washington D.C. Overwatch League franchise as the team's head coach and first player, respectively, according to the team's announcement Wednesday. Per the ​announcement, the team's assistant general manager Kate Mitchell — ​herself announced Saturday — chose the two former New York Excelsior members for the fledgling ​Overwatch team. In a statement, she emphasized the importance of the roles WizardHyeong and Janus would fill. WizardHyeong's signing comes after he ​denied rumors Tuesday that he had signed with a new Overwatch League team. The rumors began swirling when ​he announced his departure from the NYXL, the ​same day it released Janus, then 24 hours later announced he was no longer in search of a team. As the head coach for the NYXL, WizardHyeong led the team to the best record in the league's inaugural season at 34-6 and a third-fourth place finish overall. The Washington D.C. Overwatch League franchise was ​first reported on Sept. 4.